As the seasons shift during the year, a variety of pathogens begin doing the rounds, inflicting a wide range of health troubles. Children are particularly vulnerable to such pathogenic attacks as their immune systems are not mature enough to ward off the intruders. One of the most common infection that is triggered by viruses affects the respiratory tract and causes annoying symptoms like nasal congestion, sore throat, fever, body ache, and irritability. Since children are known to be curious little busybodies, they are more prone to touching surfaces teeming with germs, putting dirty knick knacks straight into their mouths, and hugging their friends who might be suffering from a viral infection, thereby giving viruses easy access to their system. Once a child falls prey to a viral infection, all hell breaks loose at home. While the child becomes cranky and irritable due to the incessant onslaught of less than savoury symptoms, the parents are often at their wit’s end trying to cope with the ailing child, manage things at work and at home, and maintain a semblance of sanity. Needless to say, most parents turn towards prevention methods to keep respiratory infections as far away as possible from their little ones. Observing good hygiene by washing hands often especially before eating, staying away from those who are sick, and teaching children how to sneeze in their shoulder instead of spraying everyone around and infecting them as well are the most important steps towards achieving an infection-free year. Other than this, consuming natural preventative remedies can be of great help when it comes to avoiding issues like the common cold and influenza. 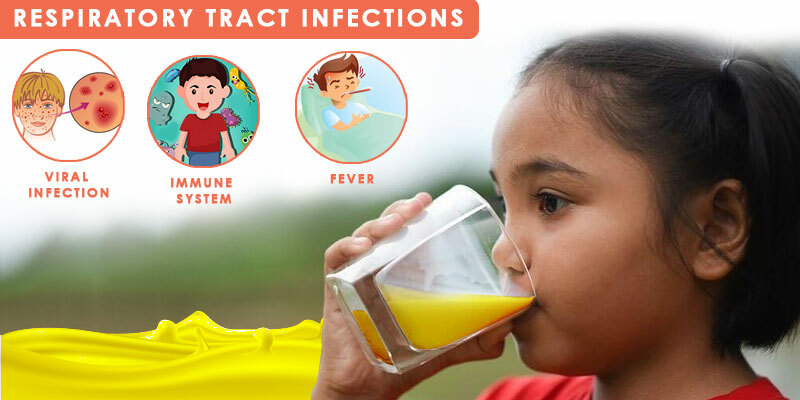 One such remedy that can help improve a child’s immunity so that he is protected from viral attacks involves a compound known as curcumin. Found in the turmeric root, curcumin is a phytochemical that is blessed with a rich cache of therapeutic benefits. Curcumin is an antioxidant and can help neutralize free radicals generated by the body’s immune system in reaction to stress-inducing elements like viruses. When free radicals increase in number in the body they also heighten oxidative stress which weakens the immune system and renders it ineffective in protecting the body from respiratory infections. Curcumin lowers the oxidative stress and thus bolsters the body’s immune strengthen, therefore, making it capable enough to vanquish viruses. Curcumin has anti-inflammatory properties that make it ideal for dealing with an infection early on and reducing the severity of its symptoms. Regular consumption of curcumin powder with warm milk and pepper can help dial down a fever, soothe body pain as well as a scratchy throat. It also helps prevent the worsening of the infection and cuts down chances of contracting pneumonia. Curcumin is a natural expectorant. It reduces the inflammation in the airways caused in response to the viral attack and hence allows phlegm to pass. Once the phlegm has cleared up, breathing becomes easier and the cough subsides considerably. Curcumin boosts the production of neurotransmitters like serotonin and dopamine that are known to relax the mind and the body. This activity of curcumin helps kids who are suffering from respiratory illnesses to sleep better and hence recover faster. One of the biggest apprehensions that parents have while picking out a curcumin supplement is the purity of its contents. This is a very understandable concern especially in light of all the adulteration-related new items that flood our newspapers and news channels every day. 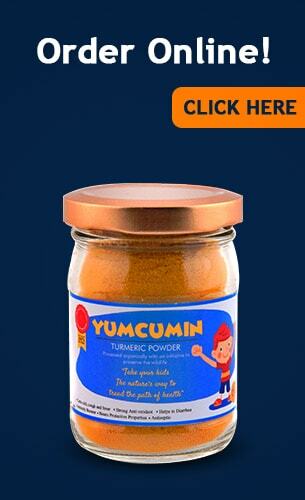 Yumcumin is the best bet for all such parents because it is made using organic and absolutely natural curcumin grown locally at Bagdara Farms, an agricultural venture located in the heart if the Bandhavgarh forests in Katni, Madhya Pradesh. A small amount of Yumcumin every night with warm milk, honey, cinnamon and a pinch of pepper is just the elixir that your children need in order to keep them shielded from viral attacks.